This caption describes two images that form a stereo-pair, that is often useful to study the same area at different times and to note any differences for further examination. This animated image demonstrates the principle of having a stereo-pair. Also noteworthy are the large meter-to-decimeter-sized boulders on the steep rim that have not been buried or physically weathered to smaller sizes in this windy region, indicating that they have not been exposed long. This is also reminiscent of Meteor Crater and examples of fresh simple craters on the Moon. The ring of rocky, cliff-forming materials in the inner wall of the crater represents original bedrock that was uplifted and exposed by the impact. The characteristic morphology is called “spur and gully” consisting of both the protruding bedrock inter-fingered with debris shoots feeding fans of sandy materials that extend down to the crater floor. Throughout this region, the present-day surface consists of a mix of global dust and volcanic sands from the Syrtis Major complex that typically cover the local bedrock. Winslow Crater is an excellent example of how craters can provide a window into the subsurface by exposing the local bedrock within the ejecta and crater wall. 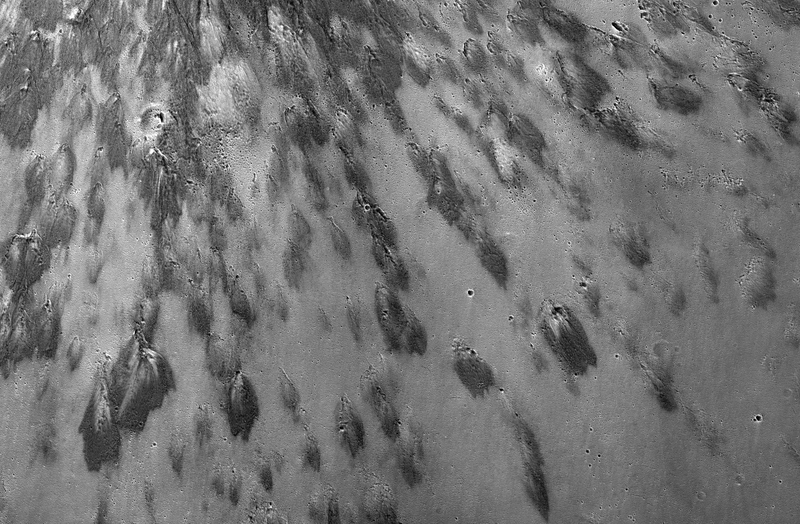 Later, this second HiRISE image of Winslow (PSP_005658_1760) was taken to obtain a stereo-pair useful for determining the relief and topography of the crater and its surroundings. By chance this second image was taken after the dust storm that enveloped the planet in June 2007. Dust deposited during this storm blanketed the region and largely obscured the brightness differences between the dark rays and the surrounding bright soil. Laboratory experiments on natural surfaces indicate that a layer of dust only a few tens of microns thick is sufficient to achieve such obscuration. 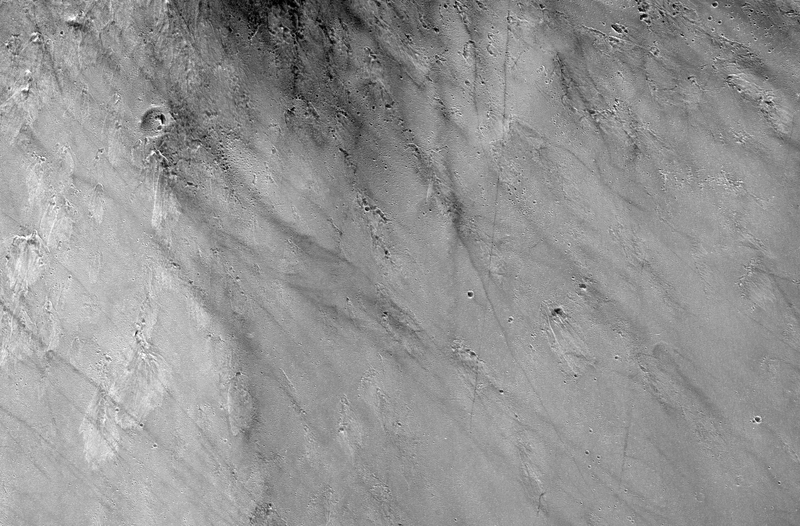 The thin dark lines that cross the later image show that dust-devils have already begun the work of cleansing the surface of dust and restoring the region to its previous appearance. Due to its similar size and remote thermal infrared (TIR) characteristics similar to Meteor Crater, Arizona, the name Winslow Crater was suggested after the small town roughly 20 km to the east of Meteor Crater, and the International Astronomical Union’s committee on Planetary Nomenclature agreed. (For further information on Planetary Nomenclature click here).